The Shakespeare Club is looking for Michael Richards. 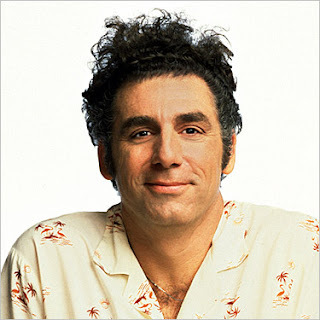 Ten-year-old Luis watches "Seinfeld" religiously and is a fan of Michael Richards in particular. I suggested that perhaps he could write a letter to Mr. Richards. "Oooo, that's tight, Ms. Ryane," Luis beamed. I like the way you act on "Seinfeld." I like the way you come in the door. I am a fifth grader and this is my last year in elemntary school. I came out on a play "Twelfth Night" and I played the prat of Sir Andrew Aguecheek. Watching Seinfeld helped me on my physical comedy. When the people would laugh it felt like a big wave of warm water falling on me. I would love it if you could send my a signed picture of your self. Thank you for all the laughs you gave me. Couldn't he use some good PR? Answer the letter, Michael. It's the tight thing to do. Today's blog was the tight thing to do, as well!